LONDON — When you live with a woman for more than a decade — as Mark Rylance did, on and off, with a certain countess famed for her beauty and her severity — you come to know her well. “I liked her enormously,” Mr. Rylance said recently, in a rush of respectful warmth. “I guess I liked the struggle between the form she felt she had to maintain and the great force within her.” He also came to realize that she was both funnier and sadder than he had at first suspected. Her name is Olivia, and Mr. Rylance won a Tony (his third) for portraying her on Broadway in Shakespeare’s Globe Theater’s magnificent, all-male take on “Twelfth Night” in 2013. As incarnated in that production, the reserved but emotionally ripe Olivia seemed to be woven out of starlight — when she walked it was as if she never touched the ground — and yet she was profoundly, fallibly human, too. I have met her three times, once at the Globe in London in 2002, and then twice when she came to the Belasco Theater on Broadway, and on each occasion she left me in a state of contented tears. She is, hands down, my favorite of all the Shakespeare performances I’ve had the chance to review. So when Mr. Rylance agreed to spend some time with me to discuss the birth and evolution of his Olivia, it felt “most wonderful,” to use one of the lady’s more memorable exclamations. We met on an early August afternoon in the upstairs bar of the Duke of York’s Theater here, just below the offices of Mr. Rylance’s friend and sometime producer, Sonia Friedman. Mr. Rylance, a recent Oscar winner for Steven Spielberg’s “Bridge of Spies,” arrived hatless (he had been wearing his signature fedora for most of his current television interviews promoting “The BFG,” the latest film he made with Mr. Spielberg) and bearing treasures. The uninitiated might have taken these to be the detritus of a recently cleaned-out desk drawer. But within the shabby folders and envelopes Mr. Rylance carried was a blueprint for an indelible performance: postcards of paintings of Elizabethan women; loose pages of notes from the production’s director, Tim Carroll, and its pronunciation coach, Giles Block; a long quotation from Francis Bacon about “the innocent and sweet play of children, which hide themselves to the end they may be found”; and a work book itemizing facts and fancies that might be extrapolated from Shakespeare’s words about the Countess Olivia. What wasn’t on paper were the shadows that would be unexpectedly cast upon the character by subsequent events in Mr. Rylance’s life. Mr. Rylance first publicly presented his Olivia (with a young Etonian named Eddie Redmayne as his cross-dressing suitor, Viola) at the Middle Temple Hall, one of the old Inns of Court in the legal quarter of London, on Feb. 2, 2002, the 400th anniversary of the first recorded performance of “Twelfth Night,” which took place on that very spot. The same production opened at Shakespeare’s Globe, the open-air simulacrum of an Elizabethan theater across the Thames, for which Mr. Rylance served as the first artistic director (and frequent leading man) from 1995 to 2005. 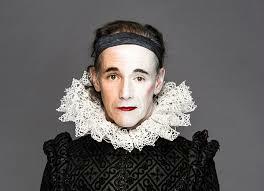 It was the fool, Feste, in “Twelfth Night” that Mr. Rylance had originally wanted to play. By that time in his tenure at the Globe, he said, he had had his surfeit of kings and princes. But after discussions with Mr. Carroll, it was decided that Olivia, the dignified aristocrat in mourning who falls in love with the cross- dressed Viola, would be a more appropriate choice. Much of the play, after all, took place on Olivia’s estate, and the Globe, for the time being, was perceived as Mr. Rylance’s house. The women who would feed his notion of this lady of the manor were varied: the Elizabethan aristocrat and intellectual Mary Sidney (on whom Olivia may have been partly based); the current Lady Salisbury, the chatelaine of Salisbury House, whom Mr. Rylance visited with a tape recorder for a tour of the estate; and the actress Judi Dench, whose recording of an Alan Bennett monologue Mr. Rylance would listen to each night before going on stage, to help him find the timbre for Olivia’s voice. Then there was the great Kabuki actor Tamasaburo. Not long before Mr. Rylance began rehearsing “Twelfth Night,” he was in Tokyo with his stepdaughter Nataasha van Kampen and saw Tamasaburo in the role of a heroic, self-sacrificing nurse in a centuries-old Japanese drama. But it took Mr. Rylance’s appearing before and connecting with a live audience, and the “collective consciousness” it brought to bear, for his Olivia to come fully into being. There were lines — including the aforementioned “most wonderful,” which Olivia exclaims when she sees what she thinks are two identical versions of her beloved — that Mr. Rylance said he hadn’t realized were funny until he heard an audience’s laughter. But it wasn’t until he returned to Olivia, 10 years after playing her at the Globe, that he began to appreciate the depths of grief felt by the character, who has recently lost both her father and brother when the play begins. York to London. Mr. Rylance withdrew from an appearance at the opening ceremony for the 2012 Olympics in London, but felt obligated to continue with the Shakespeare productions. But on the very last performance at the Belasco — perhaps on the very last occasion that Mr. Rylance would be Olivia — something extraordinary happened. Much of Nataasha’s family sat in the second row at that performance, he said: her mother (and Mr. Rylance’s wife), Clare van Kampen; her father, Chris van Kampen; and her sister, Juliet Rylance. He surprised himself by “the lightness” that infused his performance that night. “I found that I was doing things that were very jolly and light, and I had a strange feeling of ‘What’s going on?’ Suddenly, I’d be looking at the other actors and going, ‘Isn’t that funny?’ And I realized after a little while that it was Tash,” he said, referring to his stepdaughter. “It was the experience of her voice inside me. A version of this article appears in print on August 15, 2016, on page C1 of the New York edition with the headline: How Mark Rylance Became Olivia Onstage. This entry	was posted on Sunday, August 14th, 2016	and is filed under Food for Thought. You can follow any responses to this entry through the RSS 2.0 feed.